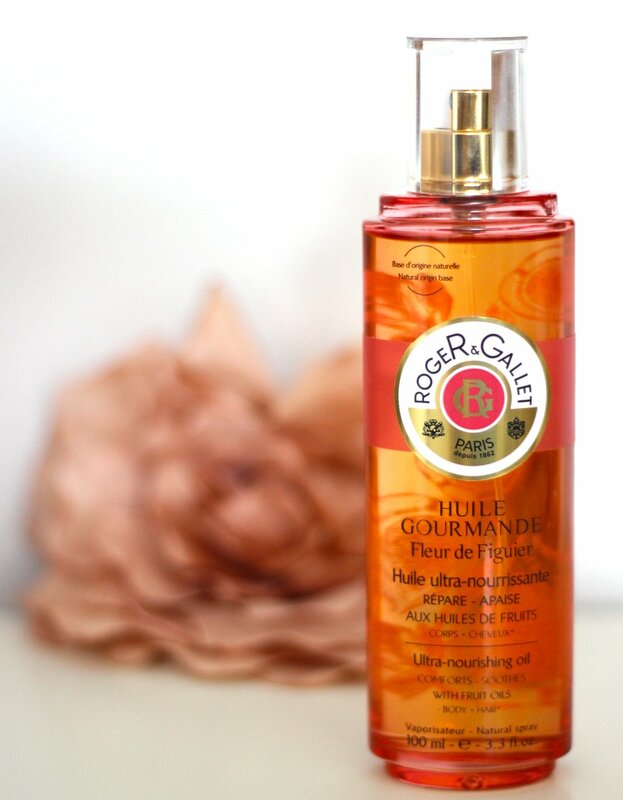 A brand new and exciting launch from Roger & Gallet has arrived at the Pink Elephant Blog HQ recently and I cannot tell you how excited I was when I saw it! I am a known fig scent addict and if I see anything fig-scented I just have to have it. There is something addictive about this scent, it’s fruity in a grown up way and earthy at the same time. It is the perfect summer scent, it smells very natural, just as if you bit into a fresh, ripe fig! And the fact that it comes in a beautiful dry oil formula makes the Fleur de Figuier Ultra Nourhsing Oil* all the more fabulous! Nourishing grape seed oil, with emollient and free radical properties thanks to its omega 6, vitamin E. Pomegranate seed oil, recognised for its soothing properties thanks to its punicic acid (omega 5), a rare fatty acid known for its anti-inflammatory action. Sweet almond oil, helps to prevent dehydration by forming a soft, protective and soothing film on the skin’s surface. Blackcurrant seed oil, with omegas 3 & 6 and vitamin E, is recognised for its ability to bring suppleness and elasticity to the epidermis. Olive oil, rich in oleic acid (omega 9) and vitamins A, B, C, E and K. Avocado oil, recognised for its regenerating and soothing powers, nourishes the skin and helps to keep it moisturised. This dry oil is suitable even for sensitive skin and can also be used on the ends of your hair (it makes your hair smell amazing!!!). To tell you the truth, I slather it on pretty much from head (well, the dry ends of my hair) to toe because I love the scent & the way it softens my skin. It gives my skin that gorgeous sheen, which is especially nice for the days I have my legs out! I also find that if you layer the oil with the Fleur de Figuier Eau Riche fragrance (€39.75 for 100ml) the scent lasts the whole day and you walk around smelling delicious! This launch gets a massive thumbs up from me, if you are passing a Roger & Gallet stand make sure you give this a sniff! There are also some other products in the range that I will be picking up as well: Perfumed Soap (€6.95), Gentle Shower Cream (€9.90) and Replenishing Body Lotion (€15). Have you tried any products from the fig range?